To meet the pace of business, many organizations are embracing staffing models that enable program execution and resource flexibility. Optiv is uniquely qualified to help you address your challenging staffing needs while protecting the bottom line. 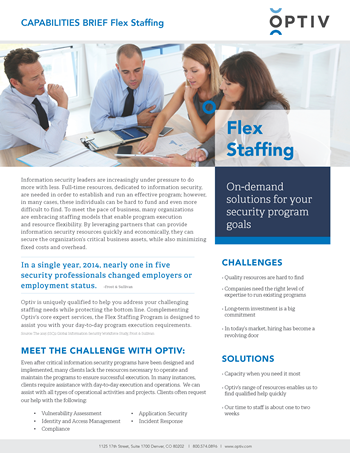 Complementing Optiv’s core expert services, learn how the Flex Staffing Program is designed to assist you with your day-to-day program execution requirements.